Persistence Market Research examines the performance of the global intraoperative imaging market for a period of eight years in a new report titled “Intraoperative Imaging Market: Global Industry Analysis and Forecast, 2016–2024.” According to the report, companies operating in the global intraoperative imaging market are mainly focusing on geographic expansion, establishing facilities in proximity to target markets and consolidation of existing manufacturing capabilities to gain larger market share. Major intraoperative imaging companies are acquiring intraoperative imaging firms in various regions to strengthen their market position and create sustainable positioning. In addition, these companies are entering into collaborations with other manufacturers and solution providers to capture a maximum share of the market. Some of the leading companies in the global intraoperative imaging market are targeting North America and Europe for launching their new range of products. The global intraoperative imaging market report begins with an executive summary giving the report data overview and the market taxonomy highlighting the different segments covered in the report. It is followed by an overview of market dynamics of the global intraoperative imaging market, which includes Persistence Market Research’s analysis of key trends, drivers, restraints, and opportunities that are influencing the growth of the global intraoperative imaging market. It also includes insights into equipment pricing for intraoperative imaging devices such as intraoperative MRI, intraoperative CT, and intraoperative ultrasound. Impact analysis of key growth drivers and restraints based on the weighted average model has been included in the global intraoperative imaging market report after detailed analysis of individual regions to better equip readers with meaningful insights on ongoing developments in the market. To understand key growth segments in terms of growth and adoption of intraoperative imaging in the detection of brain tumor, neuropsychiatric disorders, and pediatric brain tumor globally, Persistence Market Research has developed a unique market attractiveness index for the global intraoperative imaging market. The resulting index is anticipated to help providers identify real market opportunities. Lastly, the report on the global intraoperative imaging market includes a detailed competitive landscape to provide report audiences with a dashboard view based on categories of providers in the global intraoperative imaging market. Key categories of providers covered in the report are diagnostics service providers such as hospitals and healthcare centers. Detailed profiles of the providers are also included in the scope of the report to evaluate their long- and short-term strategies, key offerings, SWOT analysis, and recent developments in the global intraoperative imaging market. The forecast presented in this report assesses the total revenue by value and volume (installed base for iMRI, iCT and intraoperative ultrasound per company) across the global intraoperative imaging market. To offer an accurate forecast, the report starts by sizing up the current market, which forms the basis of how the global intraoperative imaging market is expected to develop in the future. Given the characteristics of the market, the report triangulates the outcome of three different types of analysis based on the supply side, downstream industry demand, and the economic envelope. In addition, it is imperative to note that in an ever-fluctuating global economy, the report not only conducts forecasts in terms of CAGR, but also analyzes the market based on key parameters such as year-on-year (Y-o-Y) growth rates to understand the predictability of the market and to identify the right opportunities across the market. Another important feature of this report is the analysis of key segments in terms of absolute dollar opportunity, critical in assessing the level of opportunity that a provider can look to achieve, as well as to identify potential resources from a service perspective in the global intraoperative imaging market. By component, the Systems segment is anticipated to hold the largest market revenue share in the global intraoperative imaging market over the forecast period. In terms of market value, the segment is anticipated to reach more than US$ 440 Mn by the end of 2017. The Systems segment is estimated to account for more than 70% revenue share of the global intraoperative imaging market by 2016 end and is expected to gain 30 BPS in its market share by 2024 over 2016. Systems segment is expected to reach a market valuation in excess of US$ 800 Mn by 2024. The segment is expected to create absolute $ opportunity of over US$ 30 Mn in 2017 over 2016. By the end of 2024, the segment is projected to cross US$ 830 Mn, expanding at a CAGR of 9.4% over the forecast period. In terms of revenue, the Systems segment in the global intraoperative imaging market is expected to grow 2.1X by 2024 end as compared to that in 2016. The segment is also predicted to be the most attractive, recording an attractiveness index of 1.5 over the forecast period. By component, the Services segment is expected to be the least lucrative segment in the global intraoperative imaging market, recording a market attractiveness index of 0.5 during the forecast period. The introduction of new technology by manufacturers is expected to boost demand in the Systems segment of the global intraoperative imaging market. Market suppliers are concentrating on the development of systems with upgraded coverage, mobility, ease of use and size of the system. For instance, in the last few years, companies are aiming at developing easy to use platforms that will help physicians in performing complex surgeries. Moreover, suppliers are promoting their products through free trial and demo offers, which in turn is expected to bolster demand. There are also increasing strategic collaborations and partnerships between manufacturers to help providers address maximum clinical indications by providing advanced technology. For Instance, in 2013 Imris Inc. and Siemens AG collaborated for the development and marketing of new intraoperative imaging CT scanners with the capability to produce high-resolution images and minimize radiation exposure. Similarly, Siemens and BrainLab entered into a partnership to develop an intraoperative CT package based on a rail-mounted scanner that slides into position for use during surgical procedures. Such collaborations are creating a positive impact on the Systems segment of the global intraoperative imaging market. Also, increasing use of intraoperative devices like MRI and CT systems and intraoperative ultrasound among surgeons and medical practitioners is creating robust development in the Systems segment. Use of CT and MRI is necessary for the removal of cancerous tumors as these devices can accurately visualize and identify tumors during surgery. This growing device adoption is boosting the growth of the Systems segment in the global intraoperative imaging market. North America is anticipated to remain the most attractive regional market for intraoperative imaging throughout the forecast period. The Systems segment dominated the North America intraoperative imaging market in terms of revenue in 2015 and is projected to continue to do so throughout the forecast period. 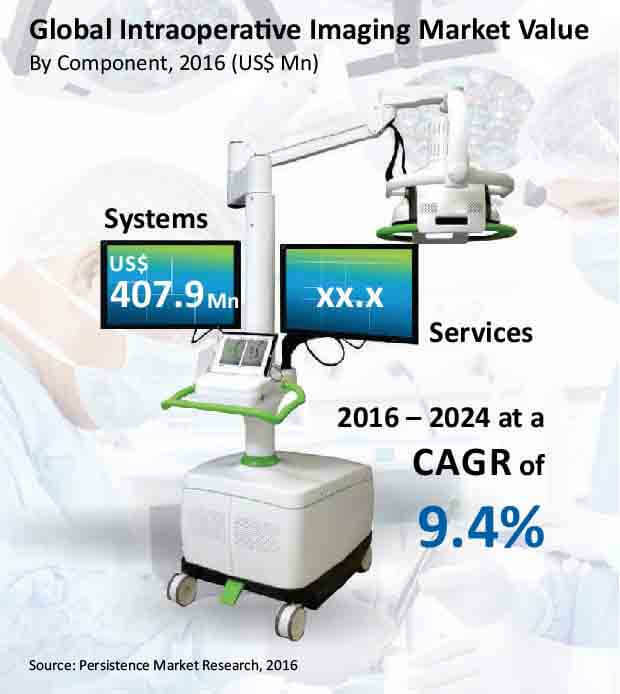 The Systems segment is expected to be the most attractive segment by component in the North America intraoperative imaging market, with a market attractiveness index of 1.5 during the forecast period.